DURING A FESTIVE 40th anniversary celebration, we cut a photo of John and Rose from the top of a white cake and shared memories snapped in the 70s. Nearly all of those memories, like the snap of the happy couple in the photo at right, were pulled from the main memory of a Nokia N8. That cameraphone, recognised as the best one in the world, worked as a rostrum camera a few weeks ago, carefully snapping shots from a 40-year-old wedding album. The results look better than the original photos in the album. 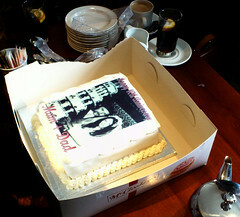 In fact, they were sharp enough to make pass-along analogue objects like the cake in this blog post. I could not get this same result with the Carl Zeiss lens in our iPhone 4's camera (I tried). I do a lot of digital work every working minute of the day. I hear people who I respect talking about backing up their digital archives, using cloud services or backup routines like Crashplan. Few of my connected friends talk about the analogue dimensions of their digital files, perhaps because they don't make hard bound photo albums--or cakes--like we often do in our home. In my experience, you can only truly experience the joy of sharing memories when you weave those memories in your real analogue world. For that, I'm glad we have our Nokia N8 cameraphone.